"Life is Beautiful" created by Yoichi Yamauchi (Yami), is an arrangement of 427 individual models. Top left: Health. Bottom left: Happiness. Top right: Have Dreams. Bottom right: Most beautiful. 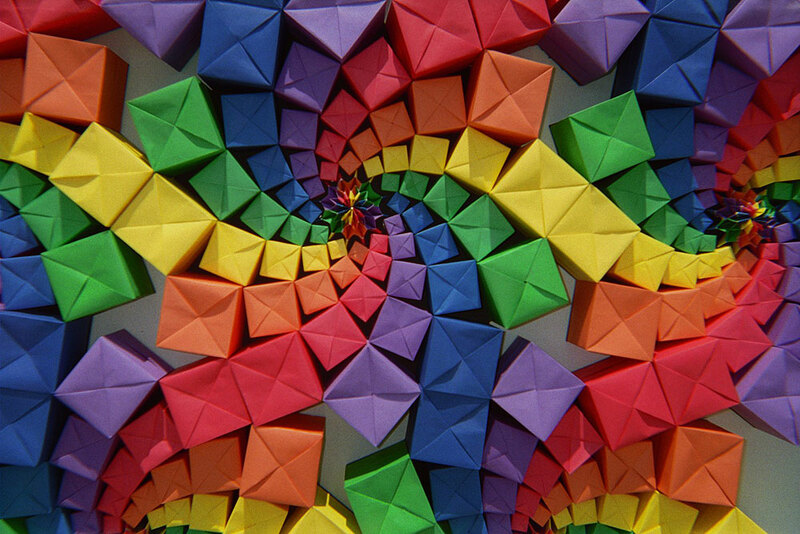 Yami Yamauchi is an origami enthusiast, teacher, and innovator who has created many, many models that inspire and delight folders of all ages. 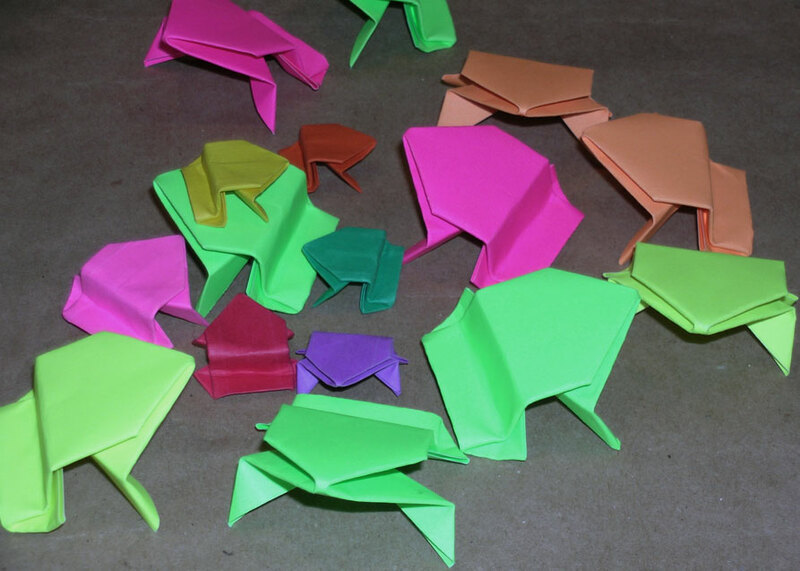 He teaches and promotes origami at schools, community organizations and motivational seminars. 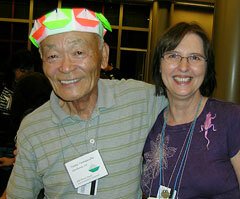 Yami Yamauchi was the 2006 recipient of the Ranana Benjamin Award from OrigamiUSA honoring his contributions as a teacher. This honor goes to an origami teacher, particularly of children, for outstanding contributions in the teaching of origami. 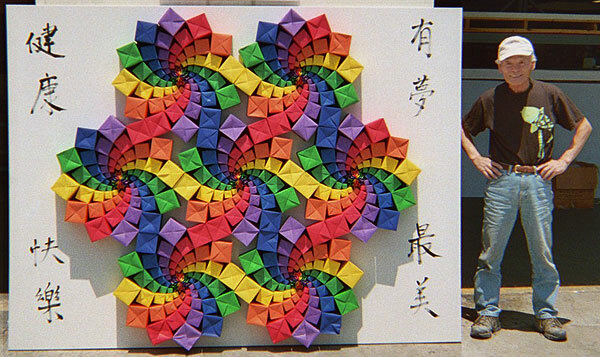 "Life is Beautiful", pictured above, was a collaborative effort with John Andrisan (mathematical graphics), Joe Hamamoto (folding) and Peter Kuo (Chinese caligraphy). To see Yami's action models in action, see video section below. Right-click diagram name and choose Save Target As... or click to open PDF file in a new window. Click photos to enlarge pics. Christmas Tree - Brighten up your holidays with this cute Christmas Tree. 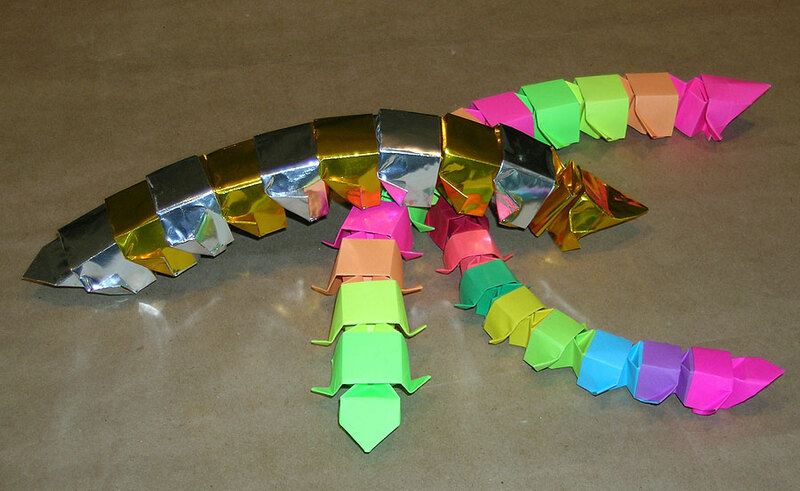 Doodlebug - Made from index cards, this model wiggles, doodles, twists and bends. Using 6 index cards, it can be squeezed down to 3 inches and expanded to 15 inches. Diagrammed by Colin Rowe. Dreidel - Yami's Diagram with paper for Dreidel by Lar deSouza. Fireworks - Modular model that explodes with color when you rotate it. Pictured at right and animation shown at the bottom of this page. Diagrammed by Mari Michaelis. Jacob's Ladder - Yami's origami version of this very cool folk toy which creates a visual illusion of each block tumbling down. Jacob's Ladder Square Panels Version - 8 1/2 x 11" paper. Diagrammed by Mari Michaelis. Little Blow Top - Don't blow your top - blow this top! Cool, sturdy little top that spins and spins. Diagrammed by Mari Michaelis. 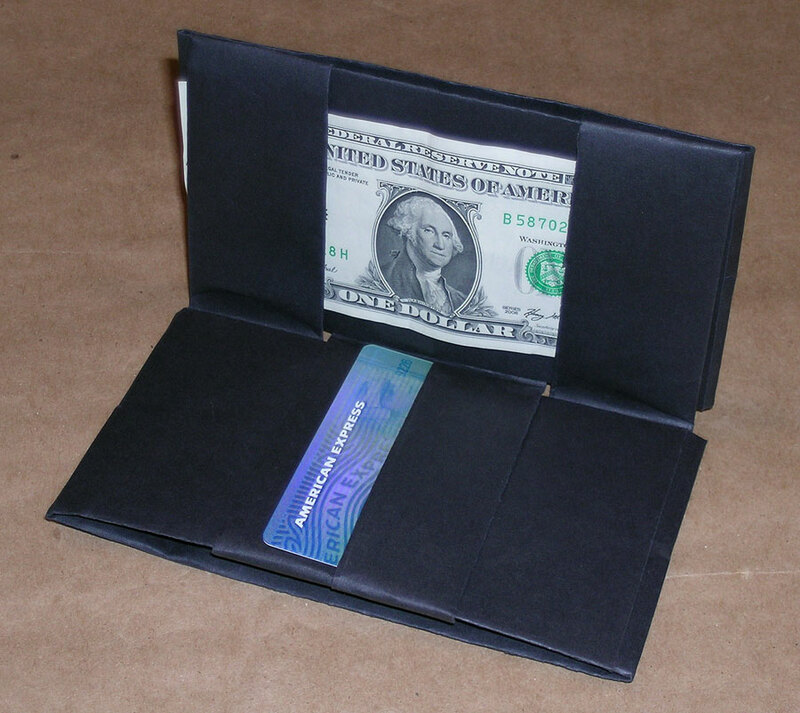 Magic Wallet - A magical wallet that makes a credit card disappear and your money move around. Diagrammed by Mari Michaelis. 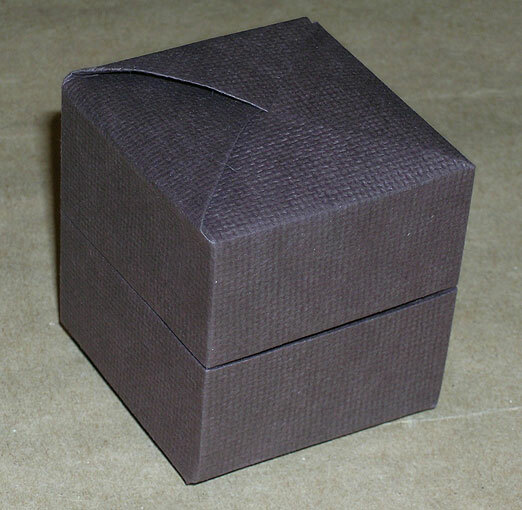 Pandora's Box - Once you solve the mystery of how to fold this box, you can give it to someone to solve the mystery of how to open it. Yami's "Life is Beautiful" was composed of Pandora's Boxes and Fireworks models. 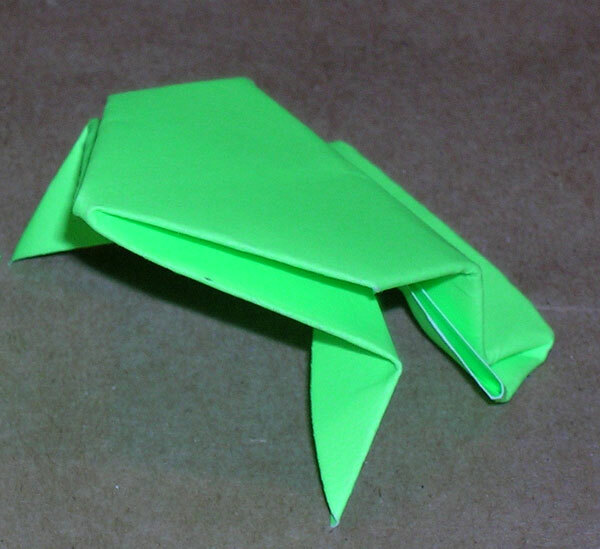 Super Jumping Frog - Made from index cards, this version of the jumping frog out-jumps all the rest! Diagrammed by A.F. Barbour. 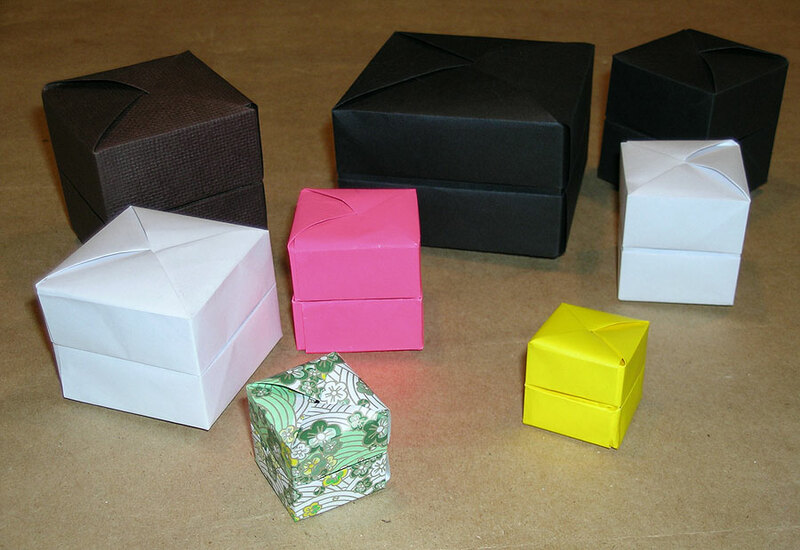 Trinity Box - Can be made from index cards, business cards or money. Diagrammed by Mari Michaelis. 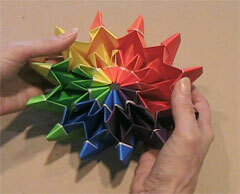 Yami's Origami Spinning Top - Spinning makes the world go 'round! 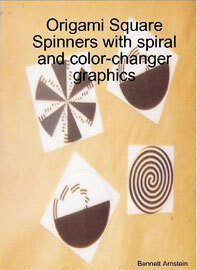 See also in Publications below: cool color-changer graphics for the spinners. Yami's Origami - Action Models - See 9 of Yami's action models in action! 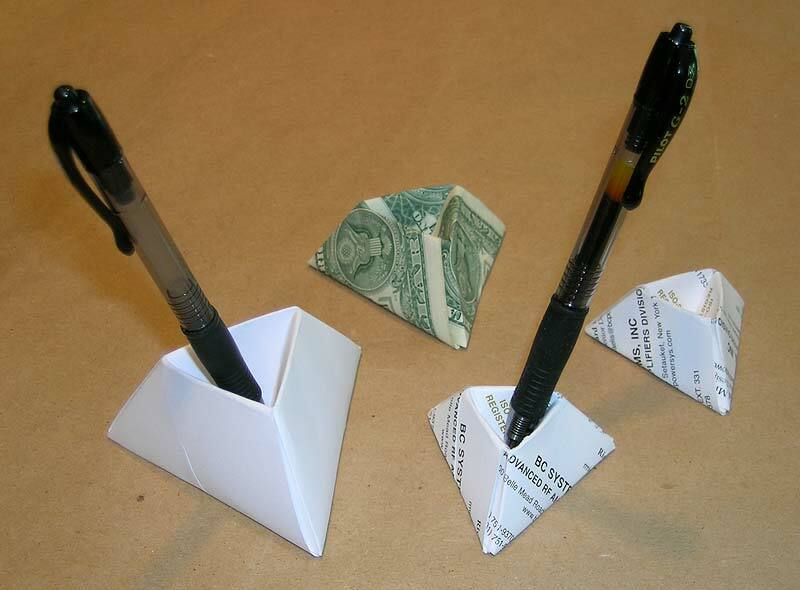 Yami Yamauchi's Magic Wallet - Origami at PMX 2008. Yami also demonstrates a new way to use Jacob's Ladder. Video by Michael Sanders. "Origami Life is Beautiful" -Cherry Blossom Festival, Monterey Park, CA 2007. Video by Michael Sanders. 2006 CAM Lantern Festival - Yami Yamauchi and Joe Hamamoto at the Chinese-American Museum in downtown Los Angeles. Video by Michael Sanders. Origami demonstration at the Cabrillo Marine Aquarium - Yami demonstrating how to fold a huge green sea turtle (John Montroll's model) at the 2006 Autumn Sea Fair in San Pedro, CA. Video by Marisol. PMX 2007 - Yami Yamauchi's Origami Panel at PMX 2007. Video by Michael Sanders. 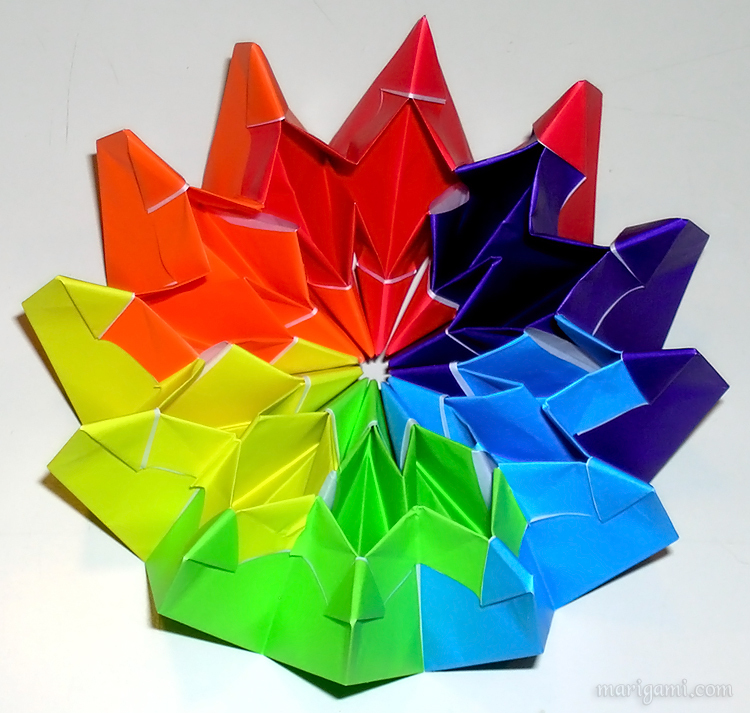 Fireworks -How to fold and assemble this multi-dimensional model. 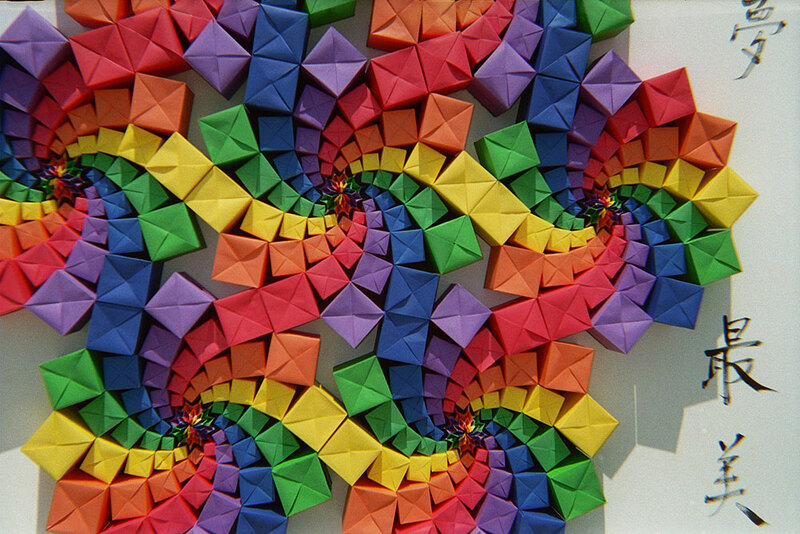 Origami Square Spinners with spiral and color-changer graphics -by Bennett Arnstein. 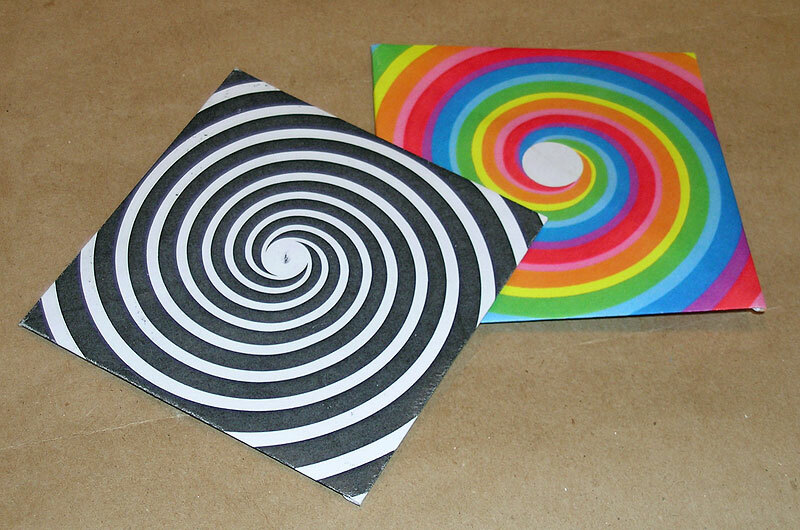 Spiral and color-changer graphics to create optical illusions for Yami's square spinner folded from a rectangle. 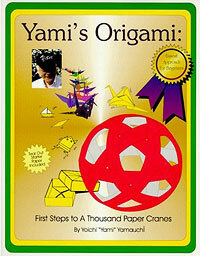 Yami's Origami: First Step to a Thousand Paper Cranes -Out of print but available on Ebay and at resellers on Amazon. Yami passed in December 2017. It is hoped that Yami's Corner will bring joy to generations to come. 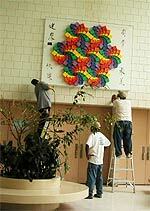 Artwork titled “Life is Beautiful” by Yami Yamauchi donated to the Bronx Psychiatric Center. 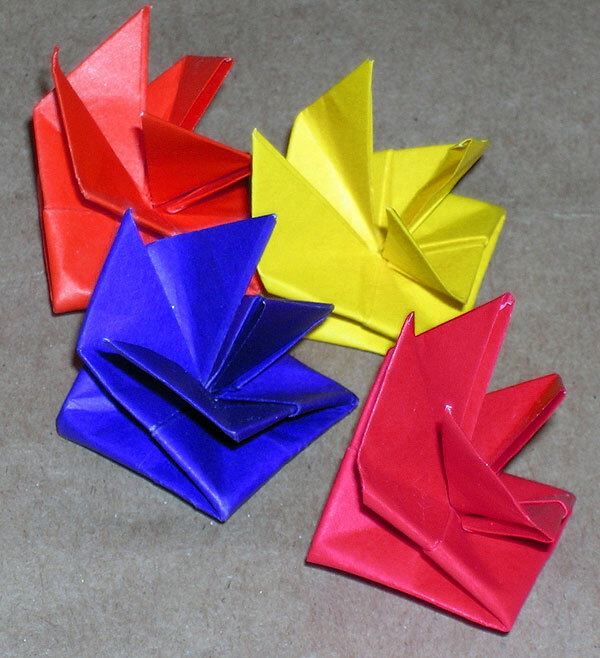 “Origami healed me from my sorrow of losing my son. I hope my art encourages people who are suffering from trauma and mental illness.” His firework-like composition is a rainbow bridge to the future. It has gained the admiration of the entire hospital community, including patients and staff members. .